This is a super fun (and silly!) activity to get kids thinking about the problem-solving skills needed to code. Teaching kids to code starts with the very basics. Preschoolers and early elementary school kids can start to apply the basic concepts of programming. This activity is great for kids age 4+! 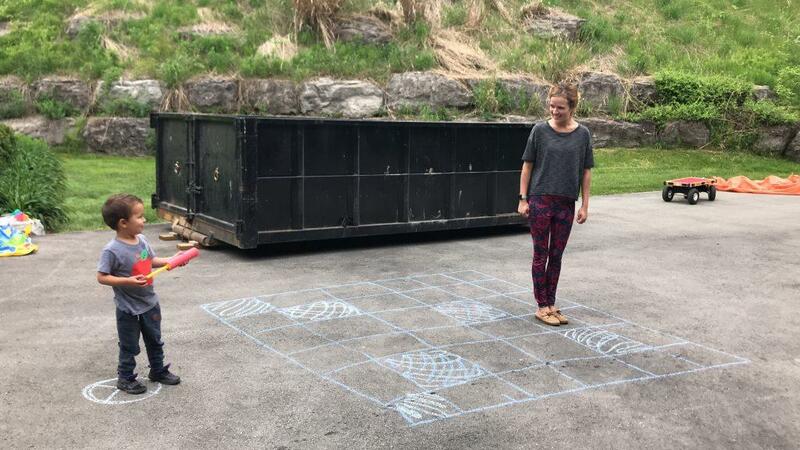 I love any chance I get to try out some screen-free coding activities, especially in the summer months when we love to be outdoors. 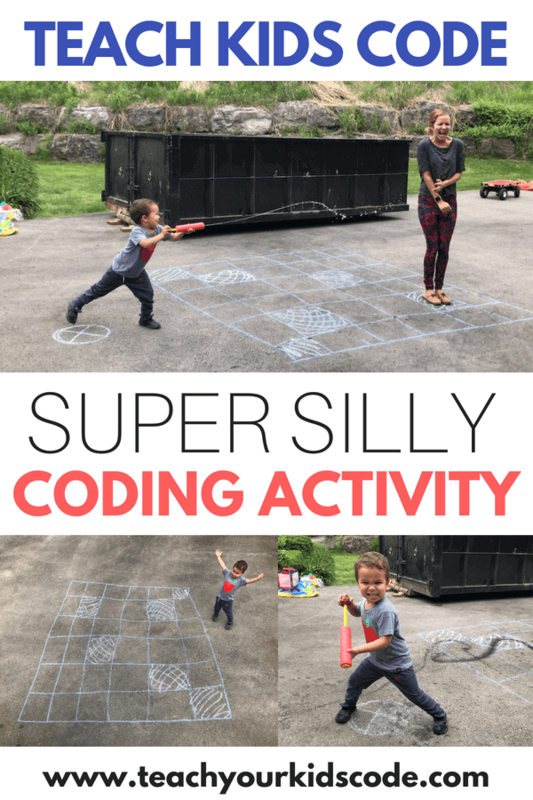 Hands-on learning for kids has so many benefits and this activity puts some coding concepts for kids to life. At its core, computer programming involves making computers do things. If I write ABC, the computer will do XYZ. This is the essential skills that we are going to be learning today! Even if your child NEVER uses code in their future, the problem-solving skills you get from coding are helpful in any field! In this activity, we will be using the concepts of sequencing and logic to get your ‘robot parent’ to the water ‘spray zone’ squares. For the advanced version, we will have a chance to ‘write code’ and learn from our mistakes by ‘debugging’. This easy STEM activity for kids requires basically NO PREP. 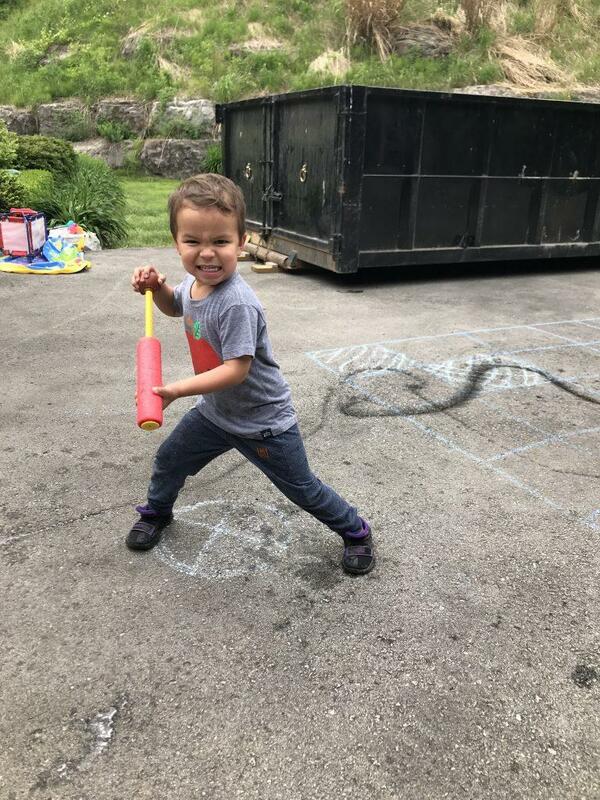 All you need is some sidewalk chalk and a water squirter. Having the water squirter was definitely the motivation for my son to participate! 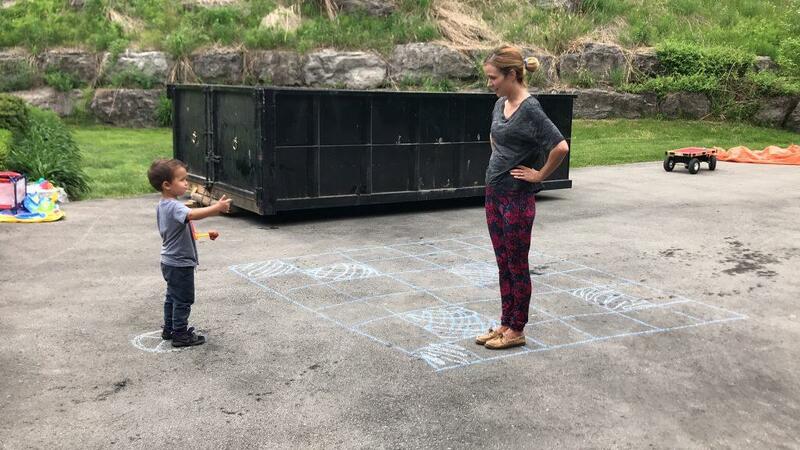 He’s otherwise pretty adept at figuring out when the ‘fun games’ I’ve planned are actually sneaky ways to help him learn math or science 🙂 When I told him that this game involved bossing mommy around and spraying me with a water gun he was PRETTY DARN EXCITED. One person is the robot parent (MOM, in this case!) and one person is the ‘programmer’. The programmer has to direct the robot using simple commands to the ‘spray zone’ squares where they get to spray their parent with water. WAHOO! 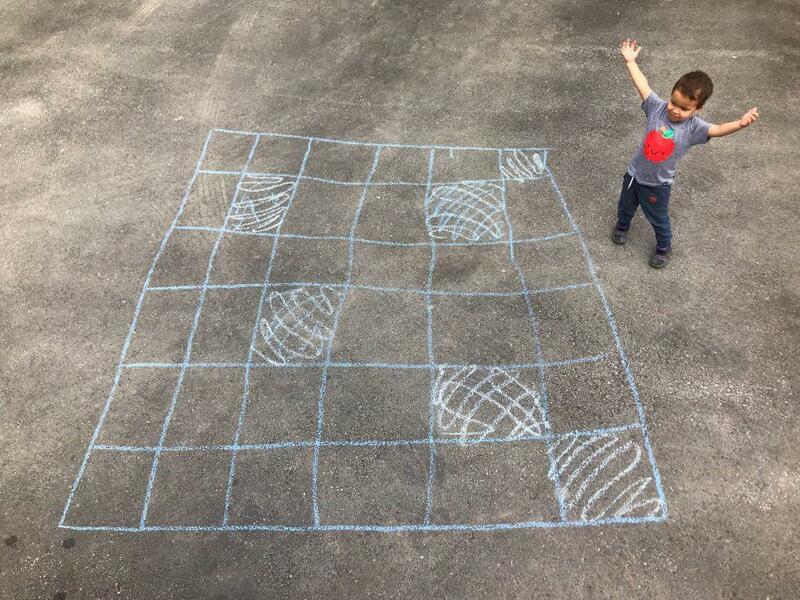 Draw out a 6×6 square grid on your driveway. It doesn’t need to be pretty. You can adjust the number of squares to suit the size of driveway or pavement you have. It could also easily be done on a sidewalk. Color in a few of the squares in white or blue. These are the SPRAY ZONE squares. When the robot lands on these squares the programmer gets to spray them with the water squirter! Fill up the water squirter from a large bucket of water. Or use a water gun that has a tank to fill. The robot can start anywhere on the grid. The programmer then has to direct the robot to land on one of the SPRAY ZONE squares. The programmer can only speak in ‘code’, meaning that they have to tell the robot EXACTLY how to get there (one step forward, two steps back etc). Being a robot is tough work! 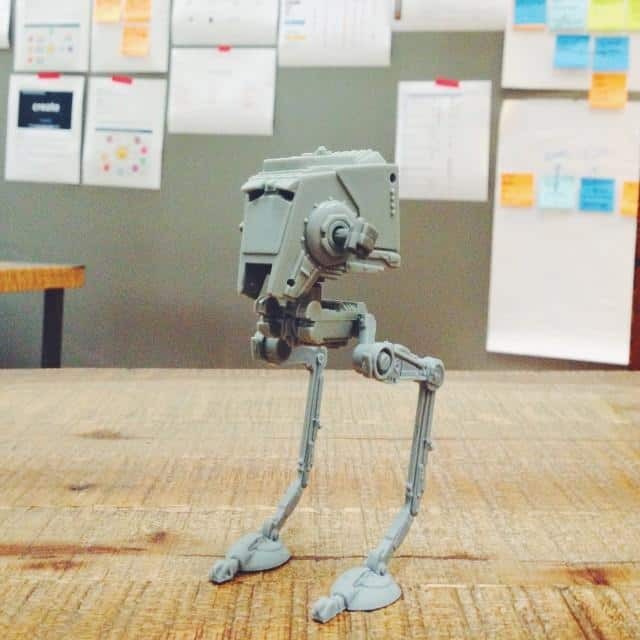 My son loved it when I used my best robot voice to tell him ‘I DO NOT COMPUTE’ when he wasn’t speaking in ‘code’. My husband went full out with his arms straight out in a robot stance and that actually helped my son to understand the direction the robot was facing. “Write The Code” – The programmer has to give the ENTIRE sequence in advance. When the robot makes it to the colored square the programmer gets to squirt the robot with a water gun. This is the reward for completing the programming, and is a lot of fun on a hot day! On the day we did this activity, there was an approximately ZERO % chance that my son was going to cooperate with me as the programmer. At age 4, he is probably a bit on the young side for acting as a robot and he also isn’t a huge fan of getting squirted with water (just loves to squirt us, SIGH!). This is something we are going to work on because I believe turn-taking is an important skill to have! There are lots of ways to modify this game to suit your needs! Silly String – If water guns aren’t your thing, silly string works in place! You can also try confetti or water balloons!